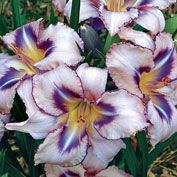 Destined To See Daylily | Gurney's Seed & Nursery Co. Unique blue-lavender coloration contrast beautifully with yellow-green throats. Huge 6-in. flowers atop tall, strong stems that bear 12 flower buds. Eye-catching color all summer long! Very low-maintenance and sweetly fragrant. Grows 20-26 in. tall. Zones 3-9. Height: 20 - 26 inches. 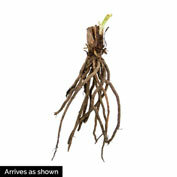 Depth: Plant crown 1 inch below soil level. 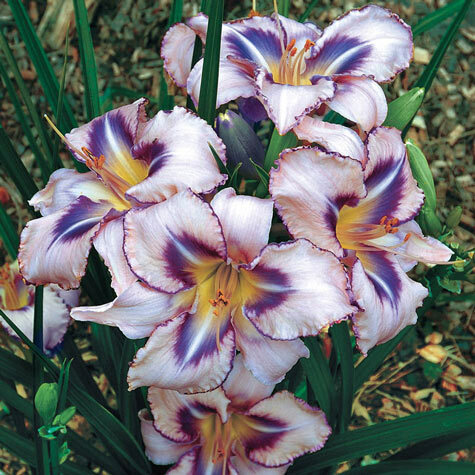 Color: Cream to pale-pink with deep purple eye zones, blue-lavender edges and yellow throats. Foliage: Dark green, narrow and strap-like foliage. Flower Form: 6 inch flowers. Fragrant. Soil Requirements: Well-drained average garden soil. Size: Clump-forming with erect flower stems. Comments: Striking and unusual blue-lavender coloration contrasts beautifully with the yellow-green throats. Has many flower stems on each plant and on each stem sits approximately 12 flower buds. Fragrant.